Back pain can be very uncomfortable, but it is not usually serious. Most back pain is caused by injury and by taking pain-killing tablets most backaches will resolve in a few days. Back pain can affect anyone, regardless of age, but it is more common in people who are between 35 and 55 years of age. If it does not, or if your back pain is accompanied by pain down your legs and arms, you should consult your doctor. Bed sores are far easier to prevent than cure. They are caused by prolonged pressure to certain parts of the body when lying in bed for long periods. They can be prevented by encouraging the patient to shift position as often as possible and taking care to smooth out creases in the bottom sheet which could lead to localised irritation. Keep your eye open for red marks appearing on the pressure points such as heels, elbows, buttocks and hips and, if they begin to appear, inform the doctor before they get worse. Do not use lotions, ointments and creams. Do not use adhesive dressings. Even in this day and age there is still no magic cure for the common cold. Colds and influenza are caused by viruses. In three or four days your body will make enough antibodies to kill the virus. However, the virus may have irritated the lining of the breathing passages and this may cause a cough. A cough is not a bad thing: it is there for a reason. It helps defend your lungs by making sure that any secretions your tubes produce are coughed up rather than settling in the lower lungs where they would cause trouble. Similarly “phlegm” or “sputum” is there to act as a barrier to catch the dust and germs that we breathe in. Your Doctor will not prescribe antibiotics for coughs, colds and flu-like illnesses because they do not work against viruses. Antibiotics can cause side-effects. Some bacteria develop resistance to the antibiotic, which can prevent it helping when it is really needed. Coughing prevents mucus from blocking the air passages. It can be dangerous to try to stop this with cough mixtures. Paracetamol (or soluble Aspirin for children over 12 years old) can be used if there is a fever. Most sore throats are caused by viruses. Antibiotics do not work against virus infections and the symptoms will usually clear without any treatment within a week. If you are sneezing, have a running nose, hoarseness, or a cough, you probably have a virus infection. Another cause of sore throats is smoking or inhaling smoke which causes inflammation and may make your throat sore. If there is difficulty in breathing. Chickenpox blisters are usually less than a quarter of an inch wide, have a reddish base, and appear in bouts over 2 to 4 days. The rash may be more extensive or severe in kids who have skin disorders such as eczema. Some children have a fever, abdominal pain, sore throat, headache, or a vague sick feeling a day or 2 before the rash appears. These symptoms may last for a few days, and fever stays in the range of 37.7°–38.8° Celsius, though in rare cases may be higher. Younger children often have milder symptoms and fewer blisters than older children or adults. Calamine lotion may be applied to soothe the often severe itching. Cool baths may also help. The most infectious period is from two or three days before the rash appears and up to five days after this date. Children may return to school seven days after the outbreak of the most recent crop of spots. Mumps is an infectious illness caused by a virus. In the 2004-2005 mumps epidemic, most of the people infected with the virus were aged between 15 and 24, but you can catch it at any age. It is now less common because of the measles, mumps and rubella (MMR) vaccination. It is most easily caught from people with the infection from two to six days before they get swollen glands to about nine days after. It usually takes about 14 to 21 days to develop symptoms after being exposed to the virus (the incubation period). About one in three children with mumps don't get any symptoms. At first, the symptoms of mumps are similar to those of flu, and can include: fever, headache, sore throat, earache that is made worse by chewing, pain on chewing and swallowing, loss of appetite, tiredness and muscle aches. If you are having a nosebleed you should: sit down and firmly pinch the soft part of your nasal cavity, just above your nostrils, together for 10 minutes, lean forward and breathe through your mouth leaning forward drains the blood down your nose instead of down the back of your throat, maintain the pressure on your nose for 15 minutes (time this on the clock) so that the blood clots, place a covered ice pack on your cheek to help soothe the area, the bleeding should stop and not start again, unless your nose is knocked or picked, and avoid blowing your nose and strenuous activity for at least 12 hours after a nosebleed. Most attacks are not serious and are usually caused by indigestion or wind. A hot water bottle will often relieve the symptoms and, in the case of indigestion, a teaspoon of bicarbonate of soda in half a glass of water will help. If the pain lasts longer than eight hours or increases in intensity you should consult your doctor. Treat as for other burns with cold water to remove the heat. 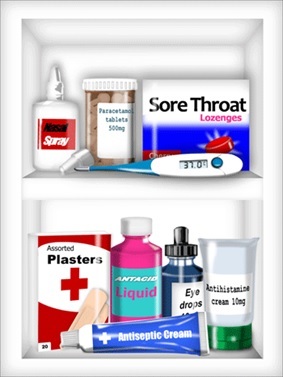 Calamine lotion will relieve the irritation whilst paracetamol will also help. Children are particularly susceptible to sunburn and great care should be taken to avoid over-exposure to the harmful effects of the sun. Always wear a high factor sun cream to prevent sun burn. Head lice are common in children, but can affect anyone of any age. They are not a sign of dirty hair or poor hygiene. Close 'hair to hair' contact is usually needed to pass lice on. Head lice cannot jump or fly, but walk from one head to another. They soon die when away from hair, and do not live in clothes, bedding, etc. Most head lice infections are caught from family or close friends who are not aware that they have head lice. Currently, there are three main ways of clearing head lice: Using an insecticide lotion. Using dimeticone lotion, a lotion that works in a different way to insecticides. Wet combing treatment (often called 'bug-busting'). The method you use to treat the lice is often a personal preference. Each method has a good chance of success, but no method is 100% certain of clearing lice. Each method is now discussed further. If you are stung by a wasp, bee, hornet, etc., then scrape out the sting as quickly as possible. Do not pluck it out as this may squeeze more venom into the skin. In most cases the sting causes pain and slight swelling, but has little other effect. Some people are allergic to stings and can develop reactions that can be life-threatening. Call an ambulance immediately if you suspect an allergic reaction soon after being stung. Insect bites (not stings) rarely cause serious allergic reactions but can cause small itchy lumps to appear on the skin. Itch may be eased by a soothing ointment, antihistamine tablets, or steroid cream. Some insects infest pets, furniture, etc., and can cause repeated bites. Antihistamine tablets can be obtained from the chemist without prescription and will usually relieve most symptoms. Diarrhoea is the passage of loose, usually watery motions. It can be associated with crampy abdominal pains or vomiting. Usually it eases within 2-3 days. Diarrhoea is unpleasant but rarely dangerous and is usually caused by a mild infection – viral or bacterial. Food hygiene: keep food covered and appropriately refrigerated and washing the hands before food preparation and after visiting the toilet are important in the prevention of diarrhoea. Drink plenty of clear fluids. Food can be taken in moderation if you are hungry. If you are unable to keep fluids down for over 12-24 hours. If the diarrhoea isn’t settling within 3-4 days. In a child less than six months old. If your work involves food. Cystitis is an inflammation inside the bladder. There may be a burning or scalding pain in the water passage (urethra) when you pass water, the need to pass water more often than usual although you may only pass very small amounts and an urgent need to pass water for fear of losing control. There may also be fever, an ache in the abdomen or back, cloudy urine or blood in the urine. Immediately drink ½ litre of water. Drink another ¼ litre of liquid every 20 minutes until you are passing large amounts of water. Take painkillers such as Paracetamol. If an attack of cystitis lasts longer than two days despite self-treatment. If you have repeated attacks. If you notice blood in your urine. If you are pregnant (contact your midwife). Gastroenteritis describes a group of diseases affecting the stomach or part of the intestine. Symptoms are often diarrhoea, sickness and stomach ache. Because the lining of the stomach is likely to be inflamed, medicines are often immediately vomited up. To avoid dehydration you should drink large quantities of water, diluted fruit juice or thin soup. If you are still vomiting, stick to water only. Try sipping it, frequently, in small amounts. Consult your Doctor if you continue to be sick for more than 24 hours (six hours in the case of babies and infants). Symptoms of German measles can include any of the following: Slight fever sometimes accompanied by a runny nose. Swollen glands behind the ears and around the neck, loss of appetite, sore throat, rash that starts on the face and then spreads to the body. This rash usually lasts for about 3 days and usually covers the body, arms and legs in small pink patches about 2-4mm, and doesn’t itch. No other symptoms are usually present apart from occasional aching joints. It is infectious from two days before the rash appears, until the rash disappears in about four or five days from that date. The symptoms of measles usually begin to develop about 7-11 days after the person first becomes infected. The first symptoms are normally similar to those of a bad cold: fever, runny nose, sore throat and a cough. A few days later a bright red, blotchy rash breaks out on the forehead, face and neck. Within a few days the rash spreads to the body, arms and legs, by which time the rash will begin to fade from the face. Measles is most infectious from two or three days before the rash appears until eight or ten days after that date. PLEASE NOTE: Immunisations can prevent this distressing and sometimes even dangerous disease.